I’m pretty sure everyone reading this is familiar with the old “blinker fluid” jokes. In case you’re not, it’s one of the oldest, most worn and tired gags in all of the automobiliverse. It’s so old it’s become a tradition; we even named our signature cocktail after it. That’s why I decided it’s time to see if, somehow, blinker fluid could really be A Thing. The basic idea of the whole blinker fluid thing is based on the idea that your car’s turn indicators require a specific fluid to work, the mythical blinker fluid. People who know even a little something about cars like to prank people who don’t by making them ask for blinker fluid from auto parts stores. It’s jumped the shark so many times, and with such grace and vigor that moms are now doing it to their sons. You can buy joke bottles of it on Amazon, even. 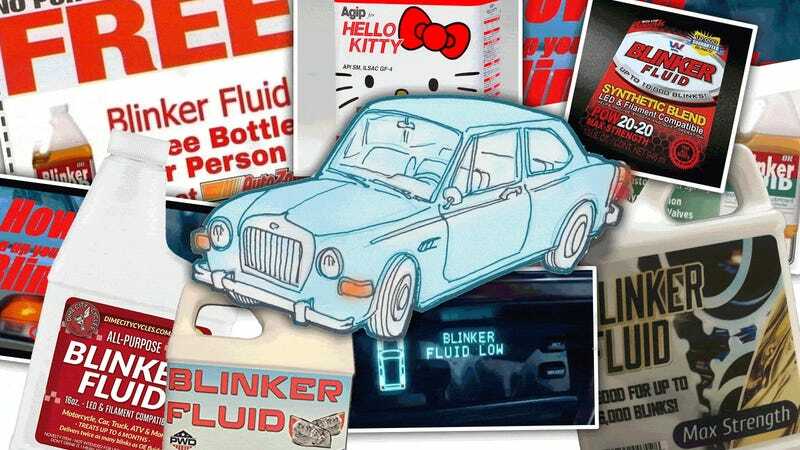 Blinker fluid is part of the collective culture of gearheads. That makes it all the more surprising that, as far as I know, no one has ever attempted to design a turn indicator system that uses a fluid to function in place of blinking electric lights. I’m going to correct this oversight right now. So get ready. I’ve designed not one, not three, but two fluid-based automotive turn indication systems, and I’d like to describe them to you now. First, we need to establish exactly what blinker fluid is. I think the most reasonable fluid is the stuff used in glow sticks, which glows bright and can glow in the correct amber color required for turn indicators. In our system, the amber dye would be mixed in with the diphenyl oxalate, and these two chemicals would be housed in a pair of reservoirs combined into one blinker fluid reservoir. This reservoir would have an injector nozzle that mixed the two chemicals, so when the blinker fluid is injected into the system, the chemical reaction happens and the fluid glows. Additionally, my system also requires the use of a clear mineral oil that will not mix with the blinker fluid. The system would work like this: there’s a central pump with three possible places it can pump fluid into: left and right indicator loops and a central set of ‘holding loops’ for when the blinkers are inactive. 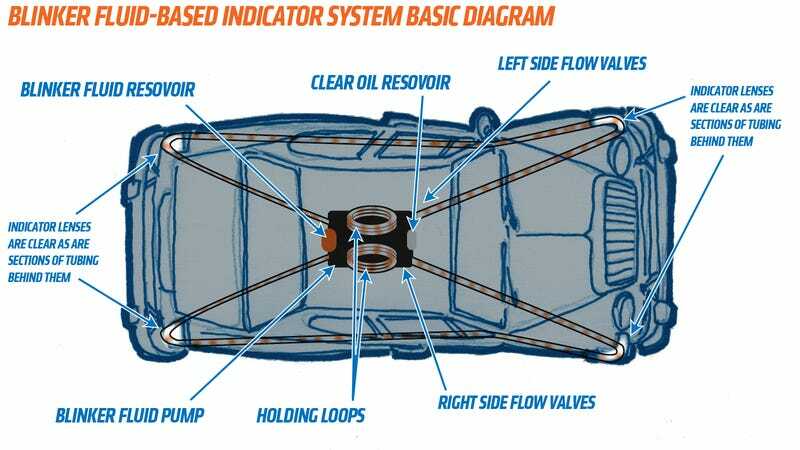 The system would work like this: when the car is started, the valves to the indicator loops would be closed and the valves to the holding loops would be opened. The blinker fluid reservoir and the clear oil reservoir would be instructed to inject their respective fluids into the holding loop in alternating bursts, creating a ‘track’ of alternating glowing amber blinker fluid and clear oil-filled sections of the indicator holding loop tubes. When a turn is indicated, valves open to either the left or right, and the combination blinker fluid/clear oil liquid is pumped through the loop, where it will eventually pass through sections of clear piping behind the indicator lenses, which will allow the glowing blinker fluid to be seen externally, through the indicator lenses of the car. The alternating blinker fluid/clear oil being pumped past the lens will appear as a blinking light from the outside of the car, accomplishing the turn indication function. Now, glow stick-type fluid only stays luminescent for a few hours; ideally, new formulations will be developed to extend the working, illuminated life of the fluid, but as it stands now the fluid will have to be pumped into a fluid waste tank (or, if you’re kind of a jerk, just sprayed out on the ground) and the system will need to be refilled from the blinker fluid and oil reservoirs. So, if you’re really, really committed to a joke, and want a car with turn signals that actually, truly do use blinker fluid, you’re looking at a system that will require at least one main pump, three electronically-actuated valves, one dual-chamber tank with a combining injector, one single chamber tank with an injector, a waste tank, and a lot of plumbing. It’s a hell of a lot more complicated than four bulbs and some wire, but, dammit, it’s worth it. This system couldn’t be simpler: an ampule of glowing, mixed blinker fluid, encased by an electrically rotating drum with a window cut into it. A weak magnet holds the drum in the closed, window-hidden position while not in use. 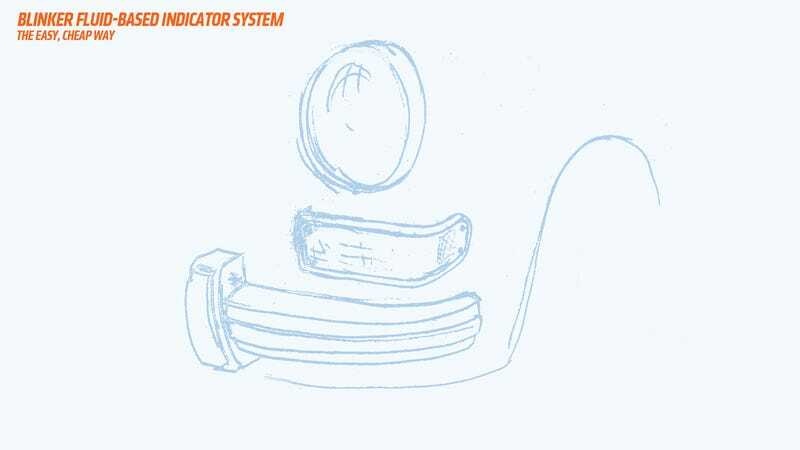 When the indicator is activated, the drum rotates, displaying the glowing blinker fluid-filled ampule at regular intervals, which gives the appearance of blinking. When the indicator is off, the magnet insures the ampule is hidden from sight. Of course, with this setup you’d have to replace your blinker fluid at least daily, likely more often. You could have a pump system set up to automatically flush and refill the ampules after a set amount of time, but by then you’re getting close to the full dual-circuit pump system I described above. What this should tell you is that using blinker fluid, were it to exist, is a terrible, terrible idea. Blinking electric bulbs are absolutely fantastic. A blinker fluid-based system would, arguably, be more exciting in wrecks, since broken indicator feed lines would bleed glowing orange ichor all over the roads, which you know would look amazing at night. Overall, I think the blinker fluid joke could be made into reality, but, of course, it’d be a terrible, vastly over-complicated idea. I’m sure British Leyland gave it a try at least once, and found that while it was more reliable than the Lucas indicators, it was a touch more expensive.